Make this the year you get out of your tent and into the comfort of an RV camper! Keystone Hideout 185LHS Single Axle travel trailers provide quality camping convenience at an easy to afford price point. For family vacations and weekend getaways, this lightweight travel trailer brand opens doors to exciting new travel adventures. One Hideout RV model, in particular, really stands out. 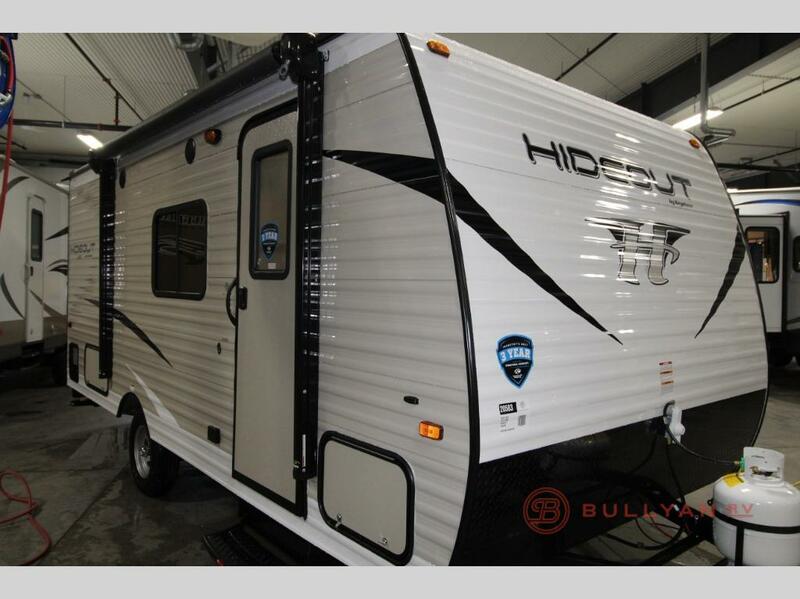 The Hideout 185LHS for Sale at Bullyan RV, is a family friendly floorplan that is an excellent choice for value minded campers. 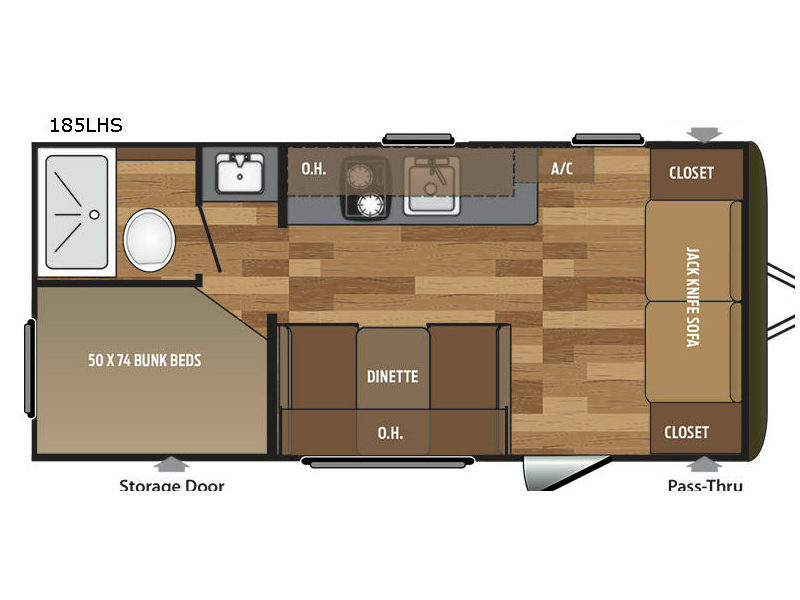 The Hideout 185LHS is smartly designed to provide plenty of seating and sleeping space for families and friends. The 186LHS bunkhouse travel trailer sleeps up to 7, has a sofa, booth dinette, full bathroom, and a well equipped galley kitchen. At only 18ft long and a weight of 3410 pounds unloaded, this compact camper is also very easy to tow. 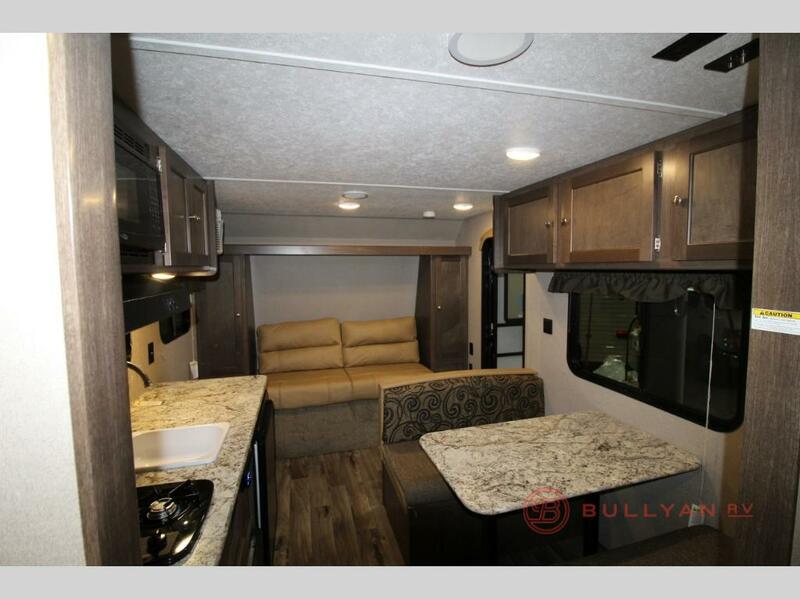 Despite the Hideout 185LHS RV’s compact footprint, this RV trailer offers plenty of comfortable living space. In the rear, you will find large 50″ x 74″ double bunk beds conveniently located near the bathroom. The jackknife sofa at the front of the trailer easily folds out into a bed. The dinette also transforms into another well padded sleeping space. Campground cooking just got easier. Keystone Hideout Single Axle trailers are equipped with a cook range with high output burner, microwave, refrigerator, and sink with a high rise faucet. Feel like a picnic? Move the party outside and enjoy the open air under the Hideout’s full length patio awning. On the outside, you will also find a large pass through storage compartment, exterior speakers and four heavy duty stabilizer jacks. Even though the Hideout 185LHS is available a low introductory level price point, there is no sacrifice in construction quality. This well built travel trailer has a hurricane straps reinforced structure, full length outriggers, walk on roof and cambered chassis. 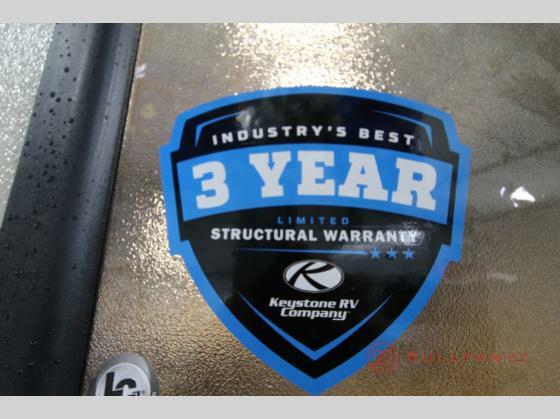 With Keystone’s industry leading 3 year limited structural warranty, you can buy with confidence. Don’t spend another summer waking up in a hot tent. 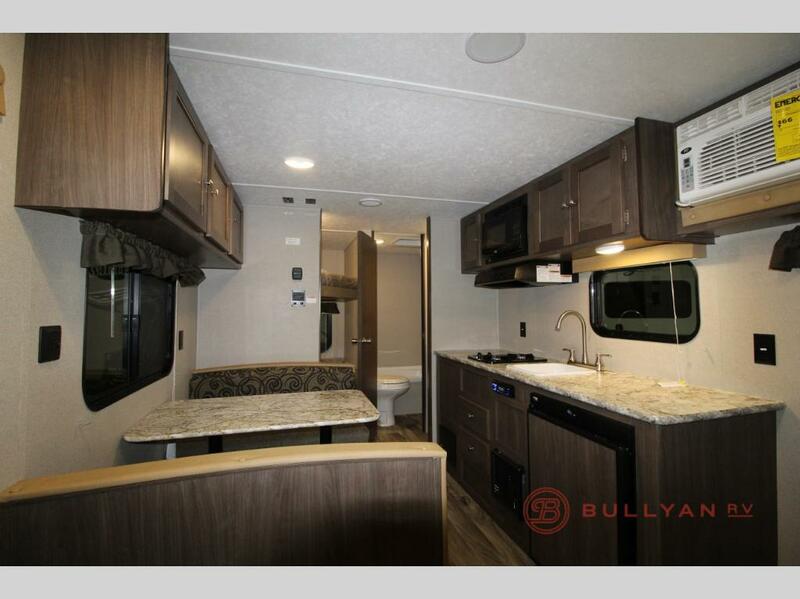 Contact Us at Bullyan RV or visit us at Our Location and take a tour of the Keystone Hideout 185LHS. Your family will thank you!